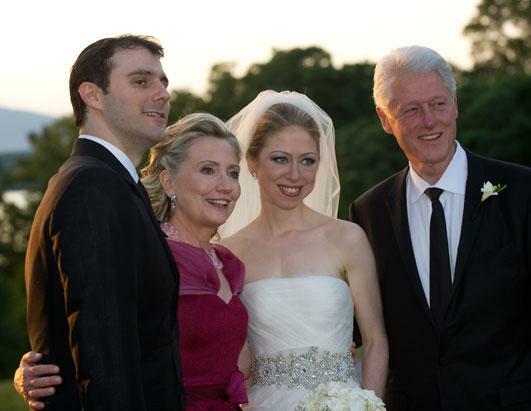 Chelsea Clinton wed Marc Mezvinsky in a sunset ceremony on the banks of the Hudson River yesterday, and we have the details! 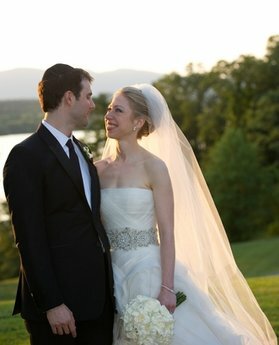 Chelsea Clinton looked stunning in a strapless Vera Wang gown with a skirt of layered tulle covered in organza and a glittering crystal belt. She was walked down the aisle by her newly-slim father Bill Clinton, who hinted in recent months that he was concentrating on dropping some pounds for the big day. The couple celebrated their differing heritages by including both a rabbi and a Methodist minister as co-officiants, marrying under a chuppah, asking guests to recite the seven traditional blessings and signing a traditional Jewish wedding contract. A reading of The Life That I Have, a poem by Leo Marks, was read to the glowing couple. The wedding took place at Astor Courts, a secluded estate in Rhinebeck, New York, with jawdropping views of the Hudson River. The location provided optimal privacy for the couple, with a 50-acre buffer zone around the party itself and a no-fly-zone enforced throughout the weekend. Neighbors were given bottles of wine and a private phone number to call if they were inconvenienced by the festivities in any way. The guest list was light on dignitaries and heavy on family and friends at Chelsea Clinton’s request. Of course, many of those friends are celebrities themselves, and local residents got glimpses of Vera Wang, Ted Danson and Mary Steenburgen, Steve Bing, Vernon Jordan and former Secretary of State Madeleine Albright. A larger chunk of guests were school pals of the couple, who met in high school. Guests enjoyed a dinner catered by the St Regis Hotel and a gluten-free wedding cake from La Tulipe Desserts. They left with bags filled with wine, a personalized corkscrew, a reusable shopping bag from the Rhinebeck Farmer’s Market, stationery, lip gloss, fresh peaches and other local goodies. They partied the night away to the tunes of Jim Valli and his band. Best wishes to Chelsea and Marc! read on for more on chelsea clinton’s wedding!